The reigning champions are chasing Borussia Dortmund. Late, late show: Ribery celebrates. For long periods, it looked as if Bayern would squander the opportunity given to them by Dortmund’s shock defeat by Fortuna Duesseldorf on Tuesday. Both sides came within inches of taking the lead in the first half. Robert Lewandowski was denied by a fine save from Peter Gulacsi at one end, while Dayot Upamecano thundered a header against the crossbar at the other. Niklas Suele and Joshua Kimmich both missed chances from close range in the second half. 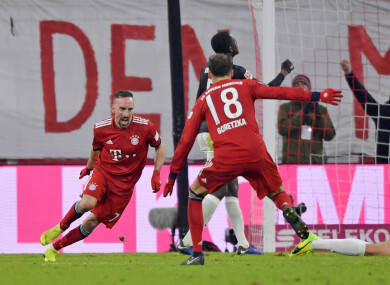 Two red cards for Renato Sanches and Stefan Ilsanker crowned a scrappy game late on, but not before Ribery had finally swept in an 83rd-minute winner to breathe new life into the title race. Bayern remain in third, but are now five points ahead of fourth-placed Leipzig. Eintracht Frankfurt, meanwhile, remain hot on Leipzig’s tail despite being held to a 2-2 draw at local rivals Mainz. Robin Quaison fired Mainz ahead on ten minutes before Luka Jovic pulled Frankfurt level on the half-hour mark. Elsewhere, Lucas Alario’s first-half goal secured a 2-1 victory for Bayer Leverkusen and plunged Schalke deeper into crisis in a cagey clash between the Bundesliga’s two under-performing teams on. The pressure has been mounting on both Heiko Herrlich and Domenico Tedesco in recent weeks, but it was Leverkusen coach Herrlich who emerged the happier man as his side ground out a valuable three points to maintain their footing in mid-table. Schalke, meanwhile, remain just a point above the relegation play-off place, having won just one of their last six league games. Werder Bremen held Hoffenheim to a 1-1 draw, while a bottom-of-the-table clash between Freiburg and Hanover also ended one goal a-piece. Email “Late Ribery winner grabs nervy victory as Bayern close the gap at the top”. Feedback on “Late Ribery winner grabs nervy victory as Bayern close the gap at the top”.